What are the benefits of experiential marketing in retail? In the ongoing tension between clicks and bricks, many retailers are focusing on how their physical stores can best stand out to shoppers; creating stickiness, relevance and ultimately value. One way retailers are doing this is by experiential marketing – creating lasting and engaging content that can be used for promotion. For example, everyone knows that when they watch TV there will be adverts, when they surf the internet there will be pop-ups. However, place a short-term and unusual activation in store and its unusual presence can capture and keep the attention to engage with shoppers. Using experiential tactics can help create a tangible connection and help stand-out from the hundreds of other products crowding the physical store environment. Whether it comes to the sampling of a new product to encourage trial and purchase, or generating theatre around an established product line, offering target shoppers a different experience has benefits both for the brand and the retailer hosting them. With the evolution of social media, virtual reality and artificial intelligence transforming the landscape, experiential has broadened the tools to create one-to-one engagements and compelling experiences, which encourage loyalty and keep consumers coming back. A recent example is fashion retailer Zara tapping into the power of augmented reality through their ‘Shop the Look’ app. 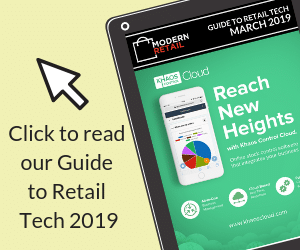 Customers can download the app and point their phones at a shop window or an in-store podium, which shows clips of models, posing, moving and even talking, wearing looks that can be ordered directly at the store. Retail activations provide direct, hands-on access to a product – meaning that brands can access immediate anecdotal feedback from audiences which can be useful for launch products in terms of estimating their broader reach and potential success. Even better, successful experiential campaigns can generate instant sales. We worked with Lurpak last year to create a festive experience nationwide over 130 days, using a Christmas tree creative and food sampling to encourage people to try new recipes during the festive season. Part of the campaign involved brand ambassadors stationed with samples and gifts directly in front of Tesco and Asda stores. The campaign resulted in a significant boost in sales, as well as creating positive brand associations for shoppers and reinforcing the brand’s links with good food. Social media plays such an important role in brand communication and is another reason why the use of experiential marketing is skyrocketing. Physical interactions allow retailers to have direct access to behaviours, and by including social sharing into the experience it allows amplification of the campaign well beyond audiences who experience the campaign directly. This positive word of mouth not only encourages more people to engage, but also helps to promote the campaign more widely. Finally, experiential marketing gives retail brands the unique opportunity to look beyond a customer’s purely transactional data and learn more about their audiences’ preferences directly. Offline data such as verbal feedback from events provides insights on engagement and other behaviours, which in turn informs future campaigns. Hosting live experiences and opportunities for brands to communicate with shoppers in a more direct and inspirational way provides a win/win/win for retailer, brand, and shopper alike. In a time when stores are competing with online for sales, real-world interactions and experiences are something which e-tail simply cannot provide. Experiential marketing enhances the customer experience and brand loyalty, not to mention building longer and deeper connections. Brands get to stand out from competitors leaving shoppers with a positive experience which resonates long after they leave a store. This is, again, priceless for retailers as it gives them a yard in what is typically a battle of inches to retain customers. Zoe Brown is Head of Account Management at BD Network and is responsible for the account management team and the planning and delivery of all client work and projects. She began her career as a client in Virgin Megastores and continued within entertainment retail, joining BD as an Account Director on the Nintendo team. After many hardware and software launches, gaming exhibitions, Pokémon tournaments and Mario birthdays, she spread her BD wings. Heading up the Mondelez account, she began with her most challenging brief – creating the Cadbury private jet – the results (and flights!) made it all worthwhile. Heading up all accounts at BD, Zoe loves the variety of work and clients, and prides herself in attending all (or as many as feasibly possible) of BD Network’s live events and ensuring that their best work goes out the door every time.